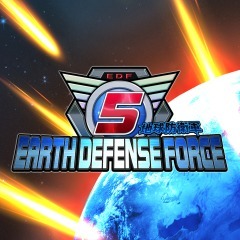 The Earth Defense Force has been around keeping Humanity safe for a while now through what could only be alternate universes. Being nothing more than brave human souls, these protectors of humanity have gone up against giant ants, spiders, flying saucers, gigantic mother-ships and increasingly more powerful versions of each. 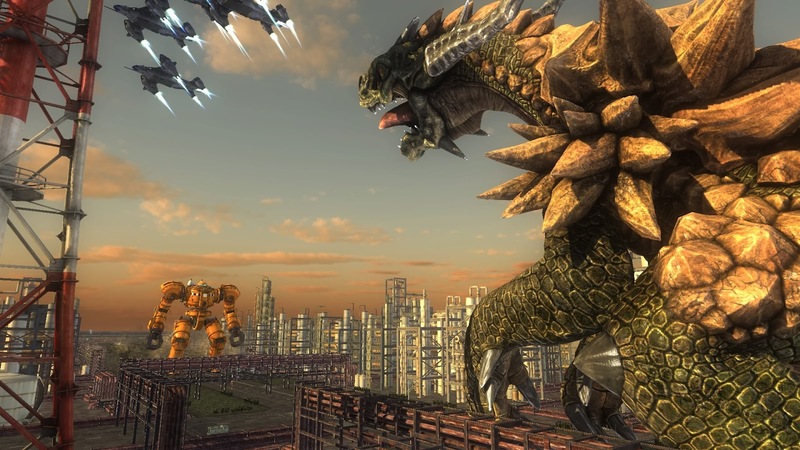 Back again for a brand new fight, Earth Defense Force 5 may be one of the best in the series yet. For those that have never heard of this niche enough series, Earth Defense Force is a video game format of a b-lister horror movie version of “something came from outer space”. Basically being attacked out of the blue one day, Humanity is shown no quarter as the invaders aim straight for where it would hurt most, its population. Over the top with plenty of cheesy dialog this series has always been fun but EDF5 takes a slightly different approach by adding a bit more of a story to it by placing you into the role of a rookie starting off as nothing more than a glorified traffic controller for the inside of a base. Now instead of being just a random military soldier that plays out as your avatar, you actually have a character that fits into the overall story as someone of “importance”. Importance may be a big word as you're not a world leader, but, people know who you are and you're more than simply a faceless avatar. This point is only further driven home by the fact that your avatar gets an upgrade once the story has moved on past a specific point. From a gameplay perspective, if you've played and EDF, you'll find yourself right at home with EDF5. Keeping with the same gameplay mechanics, you'll be controlling your character in a third person shooter style while taking out the alien forces that are invading. In your hands you have the choice of two weapons that are entirely up to you as long as they fit the class that you've chosen. Want two separate rocket launchers? That's your choice. There's no restrictions other than the ones that specify which class you want to save the world with. In regards to classes, there are four and each is available from the very beginning. Starting off with the most versatile and easy to use, you have the Ranger which is basically your standard shocktrooper. Following the Rangers in the air you have the Wing Divers which are an elite squad of female jet-packers that specialize in energy weapons. Not being limited to the ground, they can easily move around the battlefield though they've got to be careful to not get caught in spider webs that can easily immobilize them making it important to always have a source of ground support. They are fun, but it takes some getting used to and unlike EDF4.1, I found that they didn't float in the air quite so much as they used to making it a lot harder to stay in the air as you've got to constantly have your fingers pressing the ignition to more or less stay at the same altitude. Taking up the rear of the formation are the heavier Fencers. These are not some light footed sparing experts with rapiers but instead massive hulking power armored suits carrying the heaviest of weapons in order to mow down the alien invaders. Finally, providing all of the support are the Air Raiders that can call down vehicles and mechs in order to help level out the playing field. Between the four classes there is enough of a gameplay variety to please many. This is especially the case if you want to try them all out as finishing a stage with one class unlocks it for every class and you can always check the award icons for which class(es) have completed a stage. 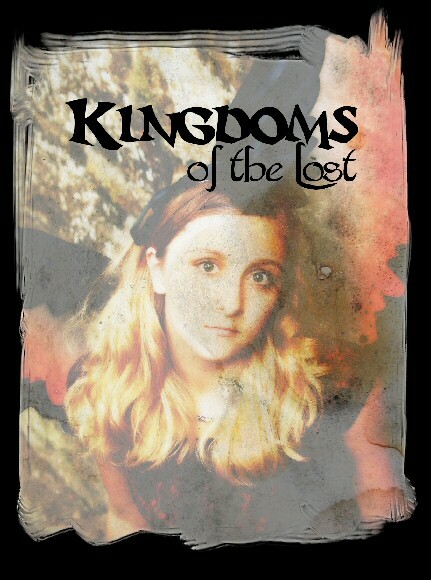 Diving into the stages themselves, they range from super short blasts of action to massive conquest like affairs making you wonder if the action will honestly ever end. There's a bit of a middle ground at times but between the shorter and the longer stages, the shorter stages were a lot more fun to play through. The biggest reason is that most stages are themed. Ants, spiders, flying saucers, giant frog like gun toting beasts that can regrow lost limbs and sometimes a combination of a few. But mostly? 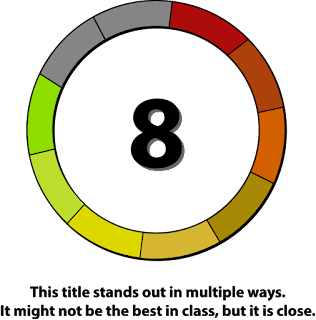 A stage with have one specific and a bit of a second. So because of this, the long stages that are nothing more than Ants, whether they are essentially charging at you with their mandibles or spitting at you, it gets boring after five or ten minutes of the same when the scenery isn't changing. The other reason that smaller bursts are better is because there's no real leveling up. 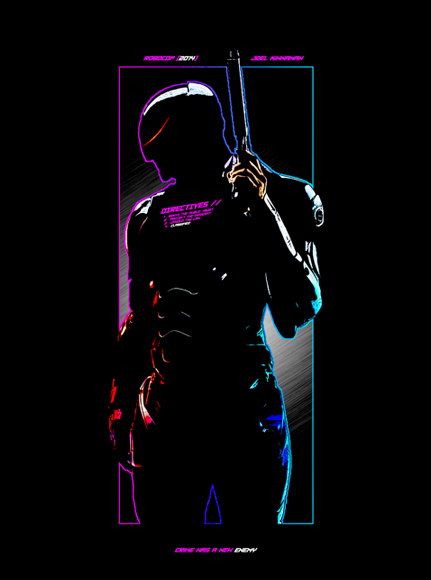 Instead, there is a chance that defeated enemies drop health upgrades known as armor, new weapons, health packs for you and health packs for your possible squad as it's possible to get NPCs to fight alongside you and a coop partner. These pickups, in the case of armor and new weapons, are not put into effect until after a stage has finished. More than that, if a weapon doesn't work as well as you thought of for your style, you're stuck with it until the stage is over. Interestingly enough, the series has moved from using a Ranger and picking up armor that the armor would just apply to the Ranger. Now, you'll only find out how much extra armor you'll obtain through the pickups will actually apply to your class once a mission is finished as there's an odd distribution algorithm in place. Basically? It's random as to who actually gets the armor applied to their class. Also, each armor pick up? Is one literal extra point. Now while the system that drives everything won't win any awards, it is a fun one. Moving around and aiming your weapons is fairly simple and it's really hard to get it wrong once you know the timing of your weapons. I say this because it's fairly easy to miss a three or four story high alien frog when you have no targeting system on your rocket launcher. What I appreciated was that regardless of the core load-out of your controls, you can modify them to fit your personal playstyle. This makes things a lot more comfortable because the default load-outs are not the best when trying to figure out where to put your fingers. That's pretty much it as you fight to save the End and its peoples. Blast some enemies, get a few more armor points, get your hands on new weapons or upgrades to existing ones and keep fighting the good fight until you've won battle after battle. 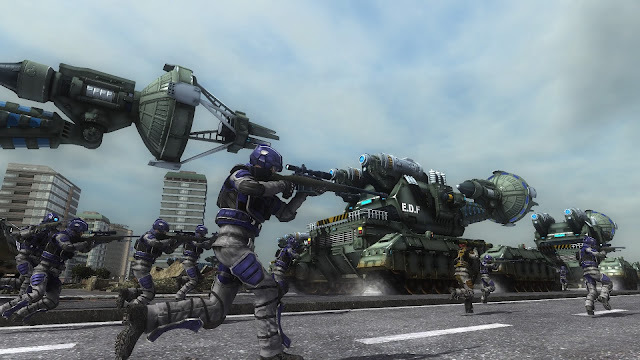 More important than that though is that EDF5 shows that this style of series can continue to thrive with some minor modifications to the experience. It's still fun to play years down the line, the premise is an easy one to follow and the gameplay is easy enough for anyone to slide into as the difficulty curve is a smooth one. 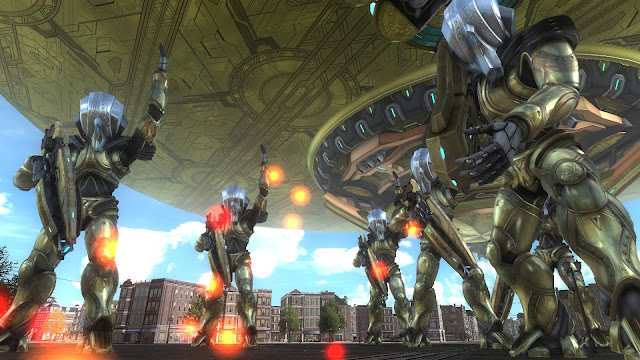 Earth Defense Force 5 is a lot of fun alone but often you'll want someone beside you for your shenanigans or someone else from online.